gText is a free resource developed specifically for teachers to communicate better with students and parents. While gText is just starting up, it has a lot of potential for being a helpful mass text alert system for teachers. 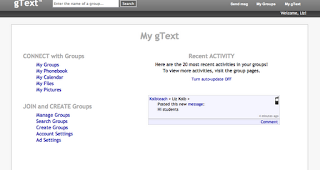 gText allows you to create as many texting groups as you wish. In addition as a member of a group you can decide how many messages you are willing to receive per day or per month (this is helpful for students or parents who do not have unlimited plans, so they can control the number of text messages being sent to their phones). All text messages are archived on the class page (and students or teachers can even comment on the text message communication!). The class pages acts and looks like Facebook. 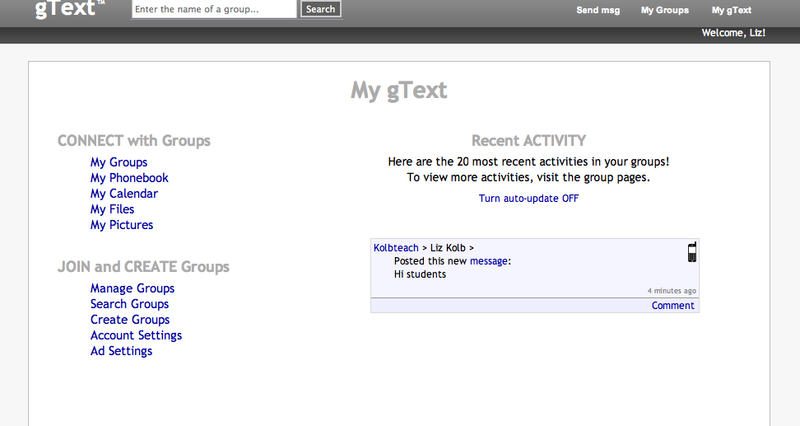 It also reminds me of Edmodo, the news feed of the text alerts and the ability to integrate classroom management options. You can also add pictures and files so that it allows for more than simple text communication. This is a feature I have not seen on any other text alert site. In addition the text alerts can be public or private (password protected). I'm hoping that these types of offers are available at the cell phone store near Calgary. Ahh.. This is good guide lines for texting and for the benefits of the students using cellular phones. I already have my own Idea on how to use the cellular phones wisely. Please visit my Blog mobile phones. Thanks!